Founded in 1731, Maison Bouchard Père & Fils is one of Burgundy’s oldest wine merchant houses. Over the centuries, the House has been devoted to acquiring highly renowned parcels, in order to build a prestigious domaine: 130 hectares of vines in the heart of the Côte d’Or - 12 classified as Grand Crus and 74 as Premier Crus. The famed vineyards include: Beaune Gréves Vigne de L’Enfant Jésus, Chevalier-Montrachet, Montrachet, Corton, Corton-Charlemagne, Bonnes-Mares and Clos Vougeot to name a few. In 1995 this exceptional collection was purchased by Joseph Henriot, and is today part of Maisons & Domaines Henriot. 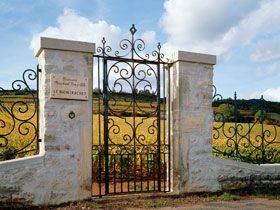 Maison Bouchard Père & Fils has invested in a modern cuverie enabling the vinification of more than 100 different crus. From the vine to bottle, the process is handled with meticulous care, to ensure the most faithful expression of each terroir. Installed since the beginning of the 19th century on the site of the ancient Château de Beaune, Maison Bouchard Père & Fils uses the underground galleries and bastions of this fortress built by Luis XI, 10 meters below ground, for the slow maturing of its wines under optimal conditions. Millions of bottles, including a rare collection of prephylloxera wines rest in the cellars today protected by 7 meter thick walls.